Honest Kitchen Embark is an all natural grain-free turkey-based dehydrated dog food mix ideal for active adult dogs, especially those who are battling cancer. It apparently makes great “brownies” too. Try this tasty treat recipe and let us know what your pup thinks about Honest Kitchen goodness! Preheat oven to 350 degrees F. Grease a bread pan and set aside. In a bowl, mix together the Embark with the coconut, fruit and sesame seeds. Slowly add the nectar, egg and water. Mix well. Pour mixture into 8″x8″ bread pan. Bake for 40 – 45 minutes until the top is slightly browned. Cool in the pan for 10 minutes, remove the loaf and cool on a rack for 10 more minutes. Slice the loaf into 1 inch slices. These will keep in a refrigerator for a week. No time to bake? 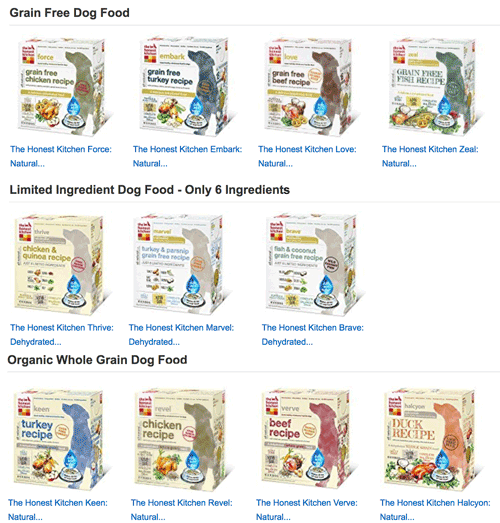 Check out all these Honest Kitchen dog treats! Got a recipe you want to share? Submit it here. Read more reviews and save at Amazon!